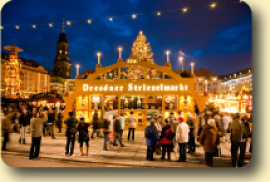 Dresden's Christmas Market is traditionally called Striezelmarkt, it is Germany's oldest Christmas Market with a very long history dating back to 1434. Its name derives from Hefestriezel, a sweet delicacy which centuries later has become know as “Dresden Christstollen” (German Christmas Cake). Most traditional Christmas gifts, toys and decorations have been invented hundreds of years ago in the Erzgebirge (Ore Mountains), when the supply of ore run out. The Erzgebirge is located only a few kilometres outside Dresden, near the Czech border. 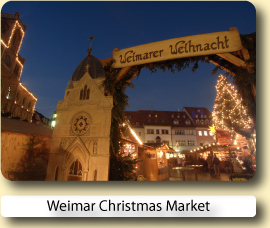 Today most of the Christmas Markets in Germany are still being supplied from this region. 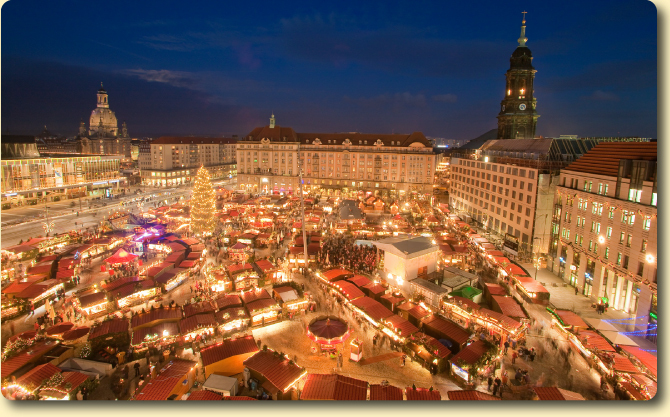 The traditional Dresden Christmas Market with its romantic and festive charm is an inspiration in itself, a real treasure trove for real traditional hand made crafts. Every visitor here will find a “little something”: Christmas pyramids, smoking figures and candleholders from Erzgebirge Mountains, indigo-dyed printed textile products and pottery from Lusatia, gingerbread from Pulsnitz, filigree lace products from Plauen, Herrenhut Advent stars, blown glass tree decorations from Lauscha, and of course specialities from Dresden itself, such as the traditional ‘Pflaumentoffel’, a chimney-sweep figure made of dried prunes. Visitors can also watch the carvers, glass-blowers and bakers in action at the crafts market. 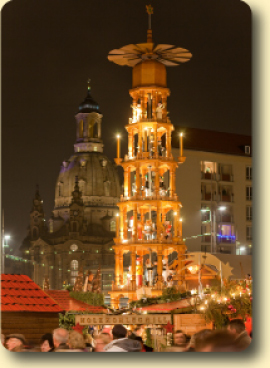 The focal point of the Dresden Christmas Market is the world's tallest Christmas pyramid, with a height of 14 metres and the world's biggest nut cracker. 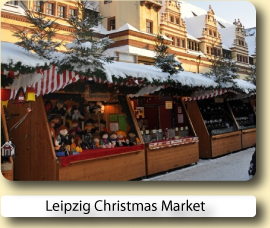 The culinary attraction of the market, however, is the Dresden Christstollen, originally known as ‘Striezel’, which accounts for the market’s name. Germany's Florence on the Elbe. 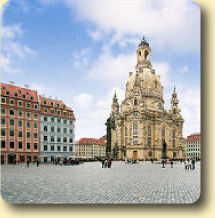 Dresden is a city packed and overflowing with culture, architectural treasures and art. The Zwinger, the Frauenkirche, the Semper Opera are all buildings of outstanding beauty. 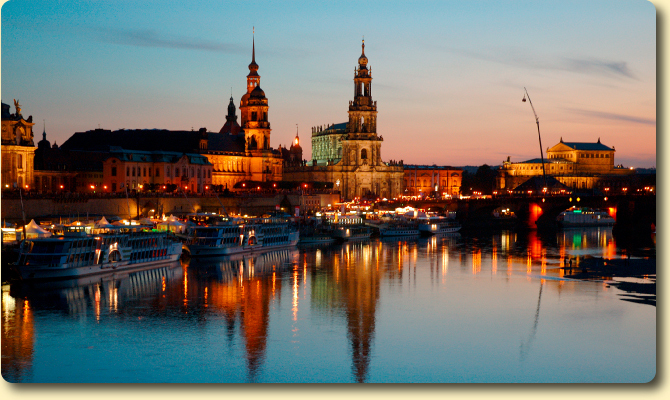 Dresden is located to the east of Germany, along the banks of the River Elbe. In spite of vast destruction during the Second World War, the city has now been restored to its former glory, as it was under the rule of Augustus the Strong in the 18th century. The Frauenkirche which was completely destroyed during WWII and reconstructed in 1996 from a mere pile of rubble and stones. Today the rebuilding of the church's outer shape including the interior cupola finished in June 2004. The exterior cupola, known as the "stone bell”, was finalized in time for Dresden’s 800th anniversary celebrations in 2006. The Semper Opera House is famous for its lavishly decorated structure and interior. The Semper is one of the most important 19th century theatre buildings in Europe. The Zwinger Palace is known as the most important late Baroque building in Germany. The famous Green Vault is Europe’s greatest jewellery collection, a treasure of dazzling display of royal riches, breathtaking diamonds and shimmering jewels. Meissen a legendary town for its beautiful production and making of porcelain. Saxony Switzerland and the sandstone mountains are an unique phenomenon of nature and rock formations, a paradise for walkers and climbers. Görlitz is an incomparably beautiful example of historical German city design and one of the most complete renaissance old towns in existence. The 18th and 19th century UNESCO World Cultural Heritage Site and landscape of the Dresden Elbe Valley extends some 18-km along the river from Übigau Palace and Ostragehege fields in the northwest to the Pillnitz Palace and the Elbe River Island in the southeast. You can't find a better hotel in Dresden. Current and flawless. Lovely 5 star hotel with all amenities being first class. Indoor pool, sauna on the top floor. Great location in the heart of the rebuilt city. This is a modern, well furnished hotel with top amenities very good service and wonderful location. Buy a one day German Rail Länder Ticket and you could explore all the Christmas Markets in the state of Cultural Heart for one amazing price of: One passenger: €23 Extra person: €4 Unlimited travel, one price, through out Cultural Heart (see map above) for up to 5 people, 9 a.m. until 3 a.m. of the following day and on Saturday, Sunday and bank holidays from 0a.m. until 3 a.m. Valid on all local trains (Interregio-Express, Regional-Express, Regionalbahn, S-Bahn). Prices quoted are for 2017 ticket machine purchases only. See the sights of Dresden the easy way with a 1-day pass to hop on and hop off a sightseeing bus tour. Choose to take any of 7 further guided tours on the same day. Head to Meissen, the birthplace of Saxon history. Visit the world-famous porcelain factory before touring the city, dominated by Albrechtsburg Castle and Meissen Cathedral..
Book your hotel for the Dresden Christmas Market with Expedia or Hotels.com.Both online reservation services will let you compare and book hotels at great low prices.